Roger Barrow's true colors and his evil intentions are revealed. Willa must race to keep her father safe but is it too late? After a controversial confrontation in the last issue, Willa races home to warn her father about Barrow's plan. Her dad may or may not know how to reverse the loss of the earth's gravity but Barrow isn't about to lose his fortune in letting him try. In Willa's attempt to help her dad overcome his fear of floating away she unknowingly sets off a series of events that have put her family in danger including the kidnapping of a friend. Now, she feels obligated to fix it all but how can she? Ever since Barrow revealed himself to be vicious and selfish by his disturbing (and unnecessary) use of violence against Willa, she's lost her air of innocence and joy. She's showing she's resilient and confident nonetheless even if it's based on guilt and fear. She blames herself for what's happened but her dad assures her it's he who's failed. This opens up a nice and needed conversation about the basis of his fears and what happened on that fateful day he lost his wife. For a fourth issue, there's not a lot of action but plenty of character development and plot progression. It should be the calm before the storm leading to what I expect to be a climatic issue five. Lee Garbett has been consistently great. He's able to tweak what looks like our world with enough touches to remind us there's very little gravity. There isn't an element that doesn't stand out. The clean lines, character designs, backgrounds, and emotive expressions tell the story with or without text. Antonio Fabela's colors bring it all to life with such effective intensity and most of all the reflective properties of things like sunlight is exceptional. 'Skyward' #4 slows things down a bit to reveal what's at stake while letting Willa and her dad clear the air. With Willa and her dad on the run, a friend kidnapped, and a desperate psychotic billionaire on the hunt, Joe Henderson sets the stage for an explosive confrontation. 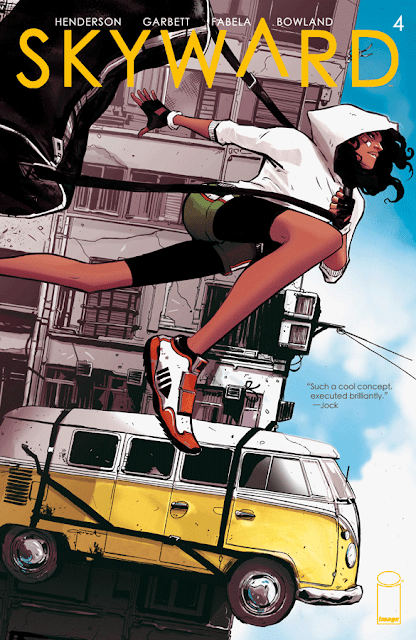 Art from Garbett and Fabela is rich and rewarding. It's uniquely entertaining and thrilling despite some bumps is a satisfying read.